- What is Session Regeneration? Session regeneration allows you to use a criteria other than the system default of placing cookies on the user's machine as the basis for counting unique clicks (hence 'session') and also is used for the attribution of a click to a conversion (hence regenerating the session), typically when tracking mobile app installs in conjunction with the CAKE mobile SDK. Session Regeneration allows you to specify a method for regenerating the session; these can involve the IP address, browser User Agent, Device, passed in tracking ID using a Sub ID or a combination of the above. 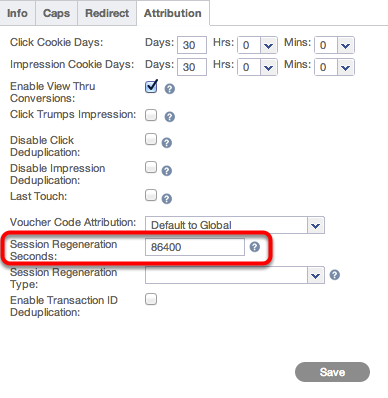 Session regeneration, like cookie days, is unique to the offer and applies to all campaigns for that offer. The setting can be found on the Offer card > Attribution tab. 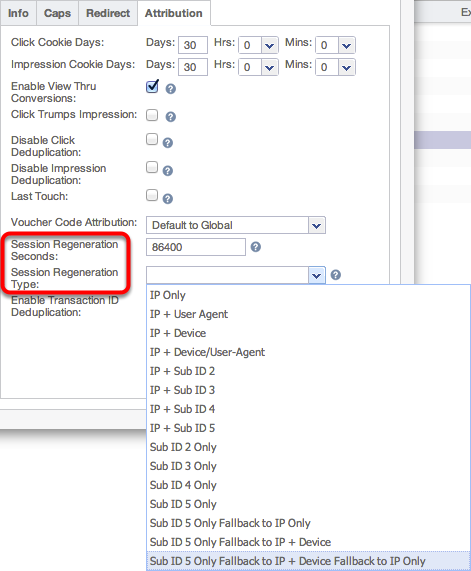 Here you will find a drop-down of the various types of session regeneration that you can choose. 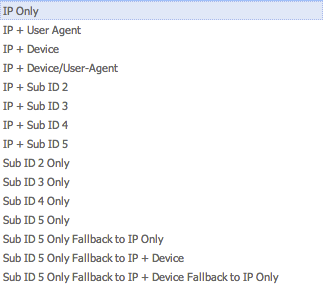 You can choose one data field like IP address or a Sub ID field (s2-s5 only as s1 is dedicated to SubAffiliate ID's) or you can select a combination of data fields. Under most Session Regeneration Types, the session regeneration duration (ie the lookback window) has a maximum setting of 1 day (86400 seconds). This means that all clicks with the same information for the selected session regeneration type will be tracked by CAKE as the same click. If you regenerate the session using only a Sub ID, the maximum lookback window increases to 30 days (2,592,000 seconds). See section below for further information on this. For example: if you select IP only and 86,400 seconds, all clicks from the same IP within one day will be counted as the same click. Duplicate clicks will be tracked both in your admin click report as well as the Affiliate Portal click report by clicking on the number of clicks in the far right column. When you are using a custom session regen type to track conversions like this, you will need to modify your pixel as well so that we can use that value to tie the conversion back to the click. CAKE will take this value and look back through all the clicks within the Session Regeneration Seconds to look for a matching value. In the case where only a SubID is being checked, this is a maximum of 30 days, otherwise the maximum lookback window is 24 hours. What Variables Can I Pass in the CAKE Basic Conversion Pixel?